← Why Sign Up for a Carpool? Martin Tomczyk visited and researched extensively about co-housing (https://en.m.wikipedia.org/wiki/Cohousing) groups and eco-villages in the New England region. Coupled with his knowledge and experience in architecture and construction, a vision for a co-housing (https://en.m.wikipedia.org/wiki/Cohousing) group in upstate New York was born: Harmony Hudson Homes EcoVillage Cohousing, and a plan for that group has been developed; with an emphasis towards: passive housing, arts & crafts, yoga/meditation, permaculture/gardening. 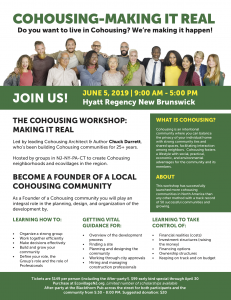 Martin is currently enrolling members interested in participating in the formation of the co-housing (https://en.m.wikipedia.org/wiki/Cohousing) group, and is in the process of securing land for the development of that group. For more information and to RSVP: https://www.meetup.com/New-York-Back-to-the-Land-Ecovillage-Movement/events/243326861/? This entry was posted in Cohousing, Community, Ecovillage, Events, Organization. Bookmark the permalink.